Traveling the world with kids can be a challenge, but exposing children to different cultures and cityscapes is as easy as a trip to the local bookstore or library. As I wrote about in The Boston Globe last year, the enchanting children’s travelogues penned by the Czech author and illustrator M. Sasek, even though most date back to the 1960s, are fantastic introductions to some of the planet’s most enticing cities. 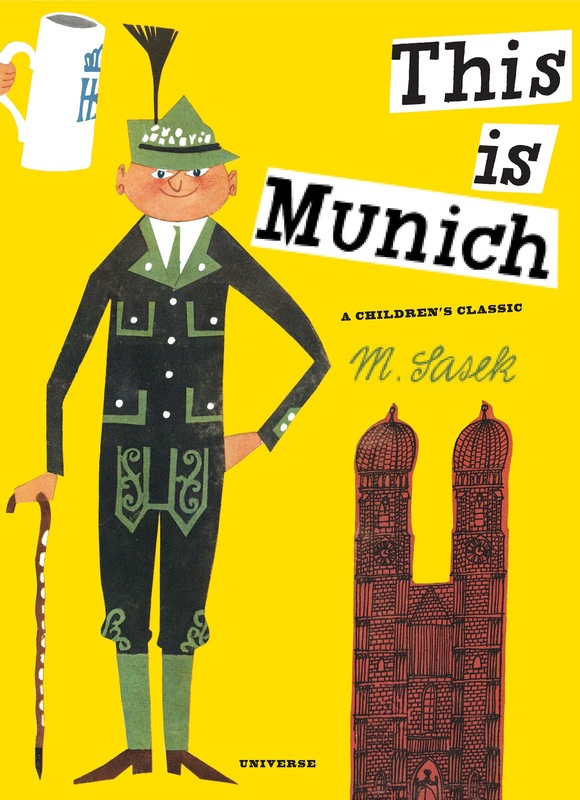 Publishing house Rizzoli has reissued most of Sasek’s titles for a new generation to enjoy, and it has just released an update to the 1961 book “This is Munich.” Like all of Sasek’s stylish books, “This is Munich” features playful ink-and-gouache illustrations of landmarks and quirky street life. The book is a visual tour of the Bavarian capital that includes landmarks you might expect in a children’s book, such as the Glockenspiel, and those you might not, like the city’s famous beer hall, Hofbräuhaus, complete with a beer maiden carrying eight huge steins by their handles. That’s part of what I think makes Sasek’s books so special. They don’t talk down to kids, yet Sasek’s subjects and colorful illustrations capture children’s imaginations. There are plenty of charming drawings of the locals in traditional Bavarian clothing. There’s certainly no shortage of dirndl-clad ladies and men decked out in alpine hats and lederhosen. Kids can also get a flavor for daily life in Munich. The drawings of Oktoberfest are alive with colors, and the image of a train station filled with Sunday skiers dwarfed by a forest of rainbow skis is captivating. Even adults are sure to learn something from Sasek’s book. Know what the Fohn is? Sasek informs us that it’s "a hot dry wind” that “causes physical discomfort and it has a depressing effect on the nervous system." As proof, he gives us an illustration of Frau Huber, a woman as green as the Wicked Witch of the West grabbing her temples. “This is Munich” transports you not only to Bavaria, but also back in time to 1961. Illustrations include now-bygone images of horse-drawn carriages delivering ice to taverns and city workers sweeping roads with brooms and shovels. Rizzoli’s “This is Munich” has 64 eye-catching pages and can be purchased through the Rizzoli web site. And if you do get inspired and make it to Munich, beware of the Fohn. Interested in learning more about your hometown and having some fun at the same time? On April Fool’s Day (April 1), join Boston by Foot for its brand new quiz and tour event, True Lies & False Facts: A Questionable Tour of Boston. Guides on the hour-long tour will tell some wild and amazing stories—some of which are true and other that are not. Your job will be to guess which is which. The answers will be revealed at the Bell in Hand Tavern, and those who guess the best will win a prize. This is the only time Boston By Foot tour guides will ever intentionally lie to you...unless, of course, they're telling the truth! And if you want to learn more about the true stories behind the Hub, Boston by Foot opens up its annual lecture series and volunteer training program to all who want to increase their knowledge about the city. The first of five Saturday lectures is on April 7 at the brand-new building on Atlantic Wharf. This year’s program focuses on Boston’s architecture and the city’s world-class buildings and spaces. The cost is $35 a lecture or $95 for the entire series.